Road trips are an American pastime—but creating music with your car on these musical highways brings a whole new level of fun to your travel. 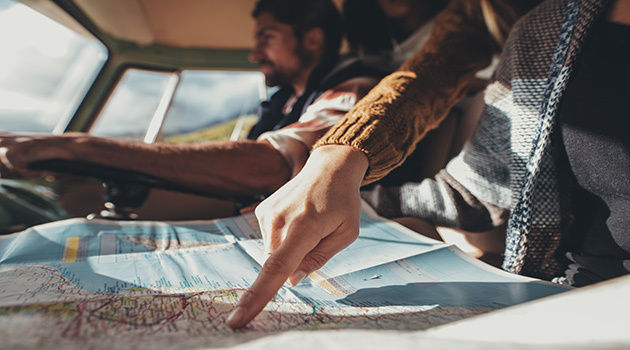 Everyone knows that music is an integral aspect of any road trip—whether it’s rocking out to your favorite band’s new album, tuning in to a killer radio station, throwing on a nostalgic mix tape, or even initiating some good old-fashioned sing-alongs. But have you ever thought about letting the road provide the tunes for you? There are just a handful of places in the entire world that offer such a unique opportunity—and two of them are in America. With the help of some very careful planning, these singing highways make literal symphonies from the streets—and a metric ton of math. To get specific, we have to get scientific: Music, like all sounds pleasant or not, is nothing more than the result of vibrations. And the speed of those vibrations dictates how the sound waves get interpreted through the human ear. Certain speeds correlate to certain notes on the scale. For example, 330 vibrations per second translates to an E note, whether those vibrations are being made on the string of a guitar or the walls of a vocal cord. To reproduce them on the treads of a tire involves a bit more work. The rubber wheels are triggered by rumble strips—the same jumpy bumps that warn sleepy drivers they’re too close to the shoulder. And spacing them out in a particular way produces the proper vibrational pattern to register a specific pitch. Yet a number of other automotive factors must come into play in order for the roads to sing: tire size makes a difference in sound quality, and—just as in music—timing and speed is a huge element for success. To pull off their musical masterpieces, engineers must first choose a speed at which they assume a vehicle will pass over the strips. If a car is going 45 MPH, for example, it will require 330 strips per second to hear an E note—or one rumble strip every 2.4 inches. The effort is dizzying but the payoff is huge: a unique marvel of engineering that brings a whole new sense to sightseeing. Though, the reward comes with a high chance of risk: throwing a rumble strip off by even a millimeter could result—and, in fact, has resulted—in a sour tune, leaving all that construction conducting for naught. Still, the extraordinarily rare singing strips should be on any road tripper’s bucket list. They’re the most fun anyone can have making songs with their car outside of an OK Go video. Keep on reading to find out more about America’s most rhythmic roadways and where to find—and hear—them. Built along an otherwise nondescript strip of road in this Southern California town, which lies about an hour and a half northwest of Los Angeles, Lancaster’s musical road was the first of its kind in America. The highway sings the “William Tell Overture” and was tuned up in 2008 by Honda as part of a marketing campaign by the Japanese carmaker. Travelers are warned of the oncoming song about a mile out from the strips, which are located between the town’s 30th and 40th Street West. And anyone hoping to hear the melody—also familiar to many as the Lone Ranger theme song—should drive in the left-hand lane and stick to the speed limit of 55 MPH for the best results. Still, even performing the drive flawlessly may be problematic for those with perfect pitch. Honda has been widely criticized for constructing all the wrong notes into the song, due to a simple slip-up in engineering. Getting the groove right would require placing the strips in certain groupings 4 inches apart. And while the rods were indeed inserted at that distance, their width wasn’t accounted for, leading to the cumulative pushing back of the structures—and the detuning of the entire melody. Though widely praised for its ingenuity, the project proved too much noise for local residents, whose petitioning got the road quickly paved over. Honda rebuilt it a few months later—and repeated their engineering mistake—at its current location. Yet curious drivers should see for themselves whether the roadway music box truly sings to them. Music, it’s said, can soothe the savage beast, so what better roadway to produce it than the nurturing Mother Road of the nation? Following the (debatable) success of Lancaster’s harmonious highway, the New Mexico Department of Transportation (DOT) decided to compose its own roadway opus along a 490-yard section of famous Route 66 located between mile markers 4 and 5, betwixt the cities of Albuquerque and Tijeras. Completed in 2014, the construction is much more fine-tuned than California’s road, playing the unquestionable—and unquestionably apropos—ending of “America the Beautiful” for drivers who find themselves motoring along the rumble strips. Again, drivers are warned of the queued-up tune about a mile out, and speed plays a key role in hearing the right notes. The song was tuned to play perfectly at 45 miles per hour, with very specific reason. According to the New Mexico DOT, which partnered with National Geographic to construct the strip as part of the media group’s “Crowd Control” series, the slower speed was meant to encourage drivers to slow down—and take in the scenery. It’s part ode to the beauty of living in the moment, part tribute to the road’s romantic past. Route 66 is the ultimate road trip bucket list item thanks in no small part to its history as a major automotive thoroughfare. And, stretching 2,400 miles across two-thirds of the continent, there were plenty of chances for drivers to “get their kicks” on the road. Still, with many newer and sleeker highways now connecting the country, the road has seen far less use over the years, and parts of it are now even considered endangered. Hopefully, with its musical quarter-mile in place, more patrons will come to sing the road’s praises.